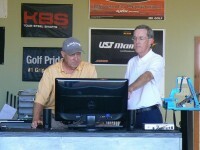 Mark Vallier and Kirk James are the owners of MK Golf Technologies located in San Antonio, Texas. Mark and Kirk have been fitting and building golf clubs and shafts since 2005. Both have been active in the PCS and AGCP national clubfitting organizations. Mark has been certified by both the PCS and AGCP. He was recently certified as a fitter by FlightScope at the 2d annual FlightScope Convention. They use the FlightScope launch monitor in all their fittings. Mark and Kirk fit everyone from pros, elite amateurs and juniors to beginning golfers.